Some 35 percent of our 32, 000 alumni volunteers have served on previous programs. Lori is a particularly loyal Poland volunteer, and over her 30-plus service programs, she’s formed relationships with several of the same students year after year. Her reflections as a Global Volunteer alumnus are excerpted from the team journal. I enjoy helping the students who contact me to practice their English throughout the year! 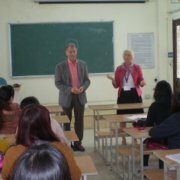 I was delighted, and remembered that we are not here to teach conversational English only. As Global Volunteers alumni, we use the “work” – in this case teaching – to form relationships between people of different countries and these informal conversations remind me that the goal of relationships has been established! https://205eev2oa0jm1t4yb914s1nw-wpengine.netdna-ssl.com/wp-content/uploads/2016/08/Lori-in-Poland.jpg 574 1500 Sam Pinakoulaki https://205eev2oa0jm1t4yb914s1nw-wpengine.netdna-ssl.com/wp-content/uploads/2016/02/2014-GlobalVolunteersLogo-Web.png Sam Pinakoulaki2016-09-13 02:28:072016-09-13 02:28:07Either They're Getting Taller, or I'm Getting Shorter!